Constipation has many causes. Most people do not know the exact cause of their constipation and thus have trouble finding lasting relief. Yet there are many natural remedies available that can be tailored to your body’s specific needs. This step-by-step guide explains how healthy intestines work and the different forms that constipation can take. 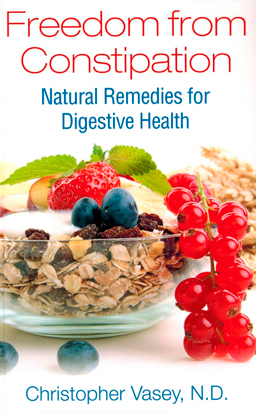 He details the 8 main causes of constipation: lack of roughage, lack of water, liver dysfunction, constipating foods or medications, weak muscles, imbalances in intestinal flora, stress and anxiety, and nutritional deficiencies. He helps you discover which of the 8 causes underlies your unique case and offers practical advice on how to correct it with natural and nonaggressive methods, such as dietary changes, herbs, and relaxation techniques. For situations when quick relief is necessary, he provides gentle ways to empty the bowels, including natural laxatives and enemas, explaining which to choose for each type of constipation, but also stressing that these are only temporary solutions. Explaining how constipation can be a symptom of a deeper imbalance, the author explores how treating it properly can restore full function not only to the digestive system but to the whole body as well. In this practical guide, you will learn how to support the work of your intestines, allowing your body to gradually resume its natural working rhythm.